Libby Bailey has been a FEI Dressage Rider and past member of the NSW State Advance Dressage Squad. She had shown thoroughbred horses for many years through out the Riverina always ensuring they would step out into the arenas with excellent presentation when competing. She now restores old rocking horses with the same level of attention to detail and finish as those she competed with in the show rings and dressage arenas. 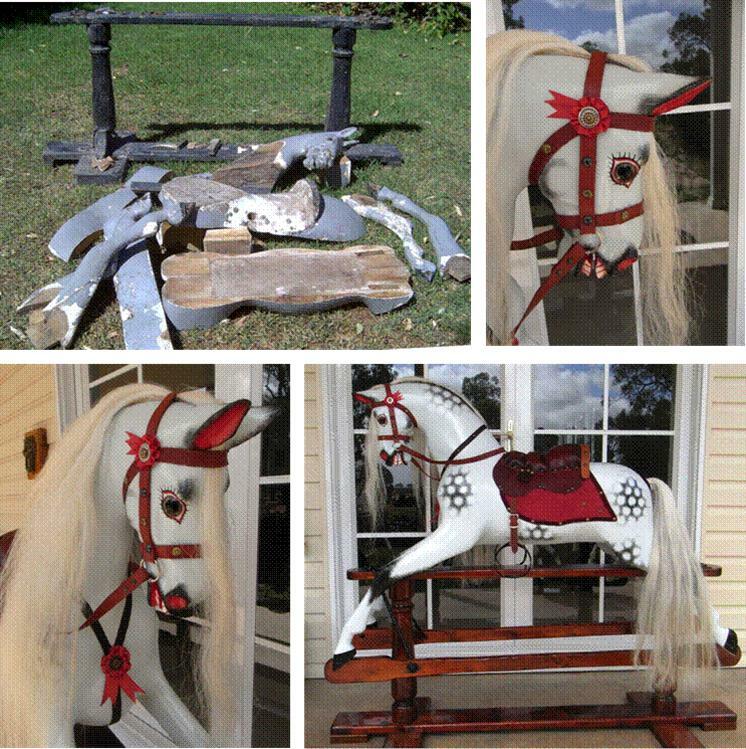 Libby now restores old Australian and English wooden rocking horses to the traditional dapple grey finish of the English horses of the past. Repair to joints, body boxes and recarved pieces can be undertaken if necessary to bring them back to their former glory. In the past years Libby has restored many Australian Roebucks, several Bartletts and English Lines and Ayres Horses made from 1885 through until the 1970s. Finished horses have all leather harness, cow or horse hair manes and tails and are painted with quality paints to give a professional high quality finish. Certificates are issued with each horse giving an outline of the history of the horse and restoration work carried out. We have a collection of Antique and Vintage English and Australian Rocking Horses that can be viewed by appointment. 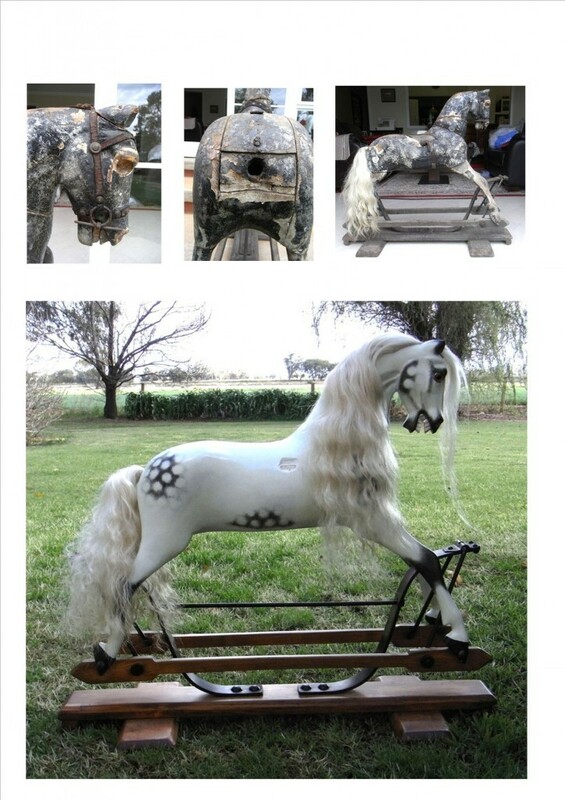 We are also looking to increase our collection and interested in purchasing Antique and Vintage Rocking Horses. Horses for Sale: Restored horses are also available for sale, but this can vary from time to time, so just contact Libby and she can let you know what is available. Wanted to Buy: Libby is always looking for old wooden rocking horses or moving horse toys, trikes etc suitable for restoration. Roderick aka Roddy — A rare and beautiful Ayres Spring Stand c1890s/1905 with all the desirable qualities one could wish for in a rocking horse —No 12 stamped on his forehead, original yellow pin strips revealed on stand, stamped brackets and Oxley springs stamps. A beautiful horse in desperate need of a full restoration. Before and after photos – As he arrived—in very poor condition, broken ears, neck, jaw, poll and leg blocks missing, replaced lower jaw eyes missing and covered with thick paint. Restored for a client. Lizzy was found beside a skip bin in Lismore and restored in 2009. She is a G & J Lines Model 21 c 1910, a very elegant rocking horse with a lovely gentle face. Lizzy is a lovely big horse stand 49 inches high. She has been sold to a family in Finley. Carmen made by G & J Lines in London c1910 before and after restoration. Carmen had a break to the front leg and a hole drilled through her face. She was imported into Australia without a stand. Carmen has a new replica stand made for her from Lines specifications, the only original part being the “paddle” side rails. Carmen has gone to a family in Melbourne.